Reposting in Deviantart | Tumblr | Instagram and removing of watermark is a NO-NO. Max: Do you love Undertale? You are so talented! Would have thought this was an official cover! I like how original this drawing is! I also like how you drew the faces! I also like how pretty much everyone in the is either in a relationship or just best friends with eachother and Asgore is just looking at Toriel like, " Accept me woman "
Flowey has accepted his place in the world. 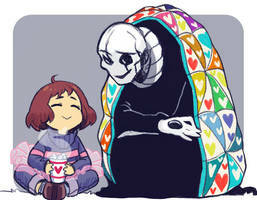 That smile from Frisk is priceless! It's amazing! I love the style and all the characters' expressions! Glad you like it bud! I do! Keep up the great work! I'm so glad you like this style!